CD-ROM No. 4 - 2005. Euro 42.-- plus pp. 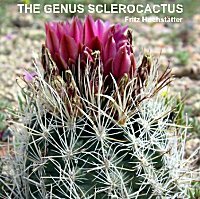 The Genus Sclerocactus Tribe Cacteae Family Cactaceae Over 1000 colour photos with indian songs. Self composed.. All species of the winter hardy genus Sclerocactus in habitat. Most in bloom and with advice on cultivation. Checklist with the three sections. Checklist of Endangered Species. List of fh fieldnumbers. Mehr als 1000 Farbphotos untermalt mit Indian Songs. Eigenkomposition. Alle Arten der winterharten Gattung Sclerocactus im Habitat, und grösstenteils in der Blüte. In Kultur mit Hinweisen. Checkliste der drei Sektionen. Checkliste der gefährdeten Spezies. fh Fieldnummernliste. All pictures and contents of the Exotic Forum (fhnavajo.community.host.de or Homepage) are protected by copyright. All publications and duplications, in full or in part, photo-mechanical or electronic duplication, and translation requireï¿½my express written permission. Also the selling of this Homepage or an individual part requires my written permission. Criminal offences will be pursued.